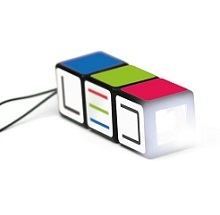 The Rubiks Cube Torch is becoming a legendary business gift that packs a unique feature along with a practical design - twist action cubes to match the brand name in order to activate the torch, whilst the customer gains retention and awareness of your brandname, and contact details on the cubes themselves! Presented in an aluminium tin, extra effort has been provided to ensure presentation being the key importance here, and your promotional Rubiks Cube Torch will look just great! Customise with your logo brand and any other details before handing out to customers and always remember - exposure is the key to your business' success! For a FREE QUOTE, please fill in the form regarding our Rubiks Cube Torch and we'll be able to help you.